This is a small corridor at the east end of Room 21, another corridor. The excavation of this room aims at understanding their relation better, as they are not aligned (fig. 1), and then the function of Room 22 just to the South of Room 6. The excavation of Room 7 continues with the removal of the fallen upper floor and the removal of the layers underneath (fig. 2). Areas of lepidha-earth and cayish earth are found, which are distinctive of roof and ceiling constructions. Moreover, there are found pieces of plaster preserving prints of roof structural elements, as wall surfaces and timber beams. Other finds comprise pieces of plaster surfaces, sometimes colored, which are a usual find in this room, and some conical cups. At the same time, the plaster surface still preserved on the southern wall is gradually revealed (fig. 3), as well as the large limestone slabs of the ground floor. Furthermore, a construction made of stones, and probably at the time also wood, was found at the door opening to Room 8 (fig. 4). This could be attributed to a door installation. The excavation in Room 21 continues with the removal of a large volume of stones and dirt, and the gradual revealing of the sides of the walls (fig. 6). Noteworthy is a partially preserved ox figurine made of clay (fig. 7). This small room seems to be distinct, though at its western part cannot be distinguished from Rooms 21 and 6. The excavation aims at revealing or not a wall, and consequently its relation with those two rooms. Some stones found are disturbed and not known if belonging to a wall (fig. 8). During the second week of work in Room 9, we almost completed the excavation of Layer 8 (fig. 1). There remains to be removed only a small part of it at the SE corner of the room, just before the opening of the doorway which leads to the adjacent Room 8. The cleaning of the outer surface of the east wall of the room was also completed during this week. Four more conical cups were found during the excavation of Layer 8. But the most abundant and important finds were again the plaster fragments, found scattered all over the excavated area and especially along the S wall of the room, where also a pithoid jar fallen from the upper storey and revealed already during the 2012 season remains in place at the SW corner (fig. 2). Many of the plaster fragments are painted, having a monochrome red, orange, yellow or black decoration on their surface. In some cases they are decorated with simple red or black bands on a white or orange background (fig. 3-5). The excavation at Corridor 10 continued for a second week revealing important information for the architecture of the building (fig. 1). Firstly, the excavation unified the north and south part of the corridor. The northern part had already been excavated in 1980s, while the southern part last year. The finds are primarily pottery for everyday use, such as conical cups (fig. 2) and juglets (fig. 3), as well as stone grinders and animal bones. It is important that large pieces of carbonised wood are continuously revealed indicating the structure of the first floor and/or the roof. The excavation continued in Room 26, while at the last day of the week, we also started removing a layer from Room 53, located at the north of Room 26. Room 26 has not given much pottery or any other finds, but is important since the burnt soil, carbonised wood and schist slabs indicate that the excavation is at the level where the floor of the upper storey has fallen. A very important find so far is the stone structure located across the west wall of the room (fig. 1). This is possibly a bench, but since only one row of stones has been exposed, it will be investigated further in the next days. It is worth mentioning that at the northest part of the stone structure, a horn of an ibex was exposed (fig. 2) along with a conical cup. Another horn, this time of a deer (fig. 3), was also exposed at close to the southern part of the structure. At moment we don’t know if these horns had any special role or if they were remains of food consumption. The excavation in Room 53 started by removing a layer of soil so as both Rooms 26 and 53 to be at the same level. The removal of soil revealed one more slab belonging to the stone structure, thus indicating that that the bench has an equal length with the opening – window between Rooms 19/26 (fig. 4). Room 19, which is located at the west of the Room 26, is possibly a light-well, and the large opening was constructed in order to let the light enter in the neighbouring rooms. 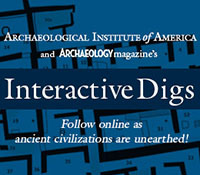 The excavation of Rooms 41, 42, 43 (fig. 1) began for the first time this week. During previews excavation seasons, only parts of the rooms’ walls had been investigated. This week, we removed a surface layer from all three rooms and cleaned their walls again. The southern wall (fig. 2, 3), which runs along all of them, seems that it is the exterior southern wall of the building. In Room 43, parts of white plaster started to be revealed (fig. 4). To the south of this room, we started removing materials which, unfortunately, had been thrown there during looting activity some decades ago. During the second week of the 2013 season we continued the investigation of the area to the north of the north facade of the central building. At the western part of the area, to the north of Rooms 11 and 12 the excavation continued in order to reveal the walls of a room indicated by the geophysical prospection. The rest of Layer 1 was removed (fig. 1) and gave many pottery sherds and a few bone fragments. Among them over 50 conical cups were found, scattered (fig. 2) and also in clusters (fig. 3). At the same time started the excavation of the central part of the area started, in order to find if the pavement continues to the north (fig. 4). Indeed a few slabs were found, that could belong to a pavement, and also a few sherds and bone fragments. This entry was posted on Thursday, July 18, 2013 at 9:08 am	and is filed under Field Notes 2013. You can follow any responses to this entry through the RSS 2.0 feed. Both comments and pings are currently closed.